The Ideal Paint & Body family is dedicated to providing exceptional service to our customers, building strong customer relationships by delivering quality truck maintenance services, safe and successful body truck repair and excellent paint jobs. Ideal Paint & Body will go the extra mile, setting the highest standards to meet and exceed our customer's truck maintenance and repair needs. Ideal Paint & Body, Inc. specializes in the repair of commercial motor vehicles including semi-tractors, semi-trailers and custom buses. Our professional technicians can handle any job from major collision repair to minor dings and dents. 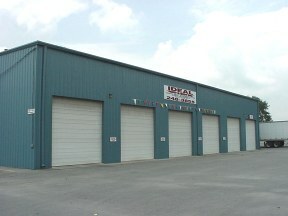 Our 10,000 square foot facility consists of 10 large bays and is equipped with a 2.5 ton overhead crane on rollers that allows us to lift cabs or transfer parts and materials throughout the shop. The 60 X 24 foot Devilbiss Down Draft Paint Booth provides our clients with exceptional paint quality. Our technicians use a variety of quality paints specific to the repair job including construction grade, industrial grade and Imron 5000 and 6000 for custom paint jobs. We spare no effort in matching the paint product to the application and OEM requirements. When repairing major damage, we can also fabricate specific parts needed for your repair. Let our experience and expertise provide the quality body repair you deserve. Become an IDEAL satisfied customer.